By now, we’re all used to seeing Katy Perry rock crazy colored hair. She’s tried every color of the rainbow, but when she popped up in Palm Springs to support the unveiling of artist Sham Ibrahim’s portrait of president-elect Trump on Saturday January 14, she had a crop of bleach blonde hair. 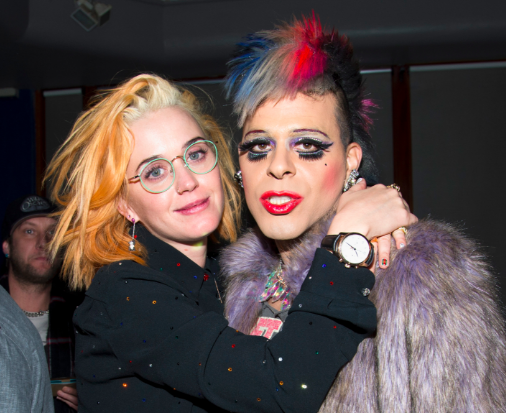 Whether it was to fit in with the theme of the night, (which is Katy’s usual MO), or just a step toward her next candy colored dye job, it was a surprise for fans and the press. With a relatively make-up free face, glasses and tousled hair she looked laid back, and, well, dare we say…normal? It’s always a treat to see celebs be “just like us,” so we’ll be the first to say Katy looks totally hot with her sassy blonde locks and fresh face, but what do you think? Is Katy’s blonde hair hot or not?